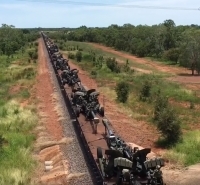 Military hardware being moved through the top end as Exercise Talisman Saber ramps up. Enjoy! https://youtu.be/ciFCdSgut64. Here is a live feed train ride which is on 24x7. It is the train driver's view, a Cab Ride, in the snow of a Norwegian Railway train. Large scale up of capability for Rio Tinto as they are scaling up their use of autonomous trains in the Pilbara following regulatory approval in late May, with the robot trains now covering 290,000km a day.